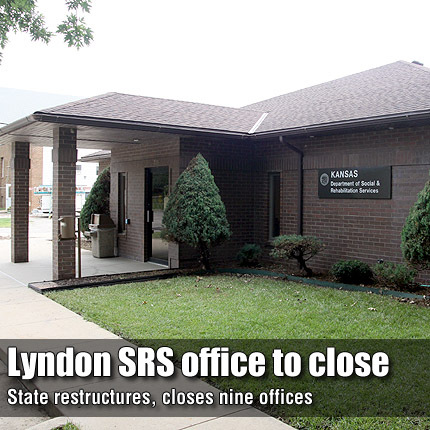 LYNDON—The Kansas Department of Social and Rehabilitation Services (SRS) is restructuring its offices statewide, a process which will include merging six regions into four and the closing of nine service centers – Coffeyville, Fort Scott, Garnett, Lawrence, Lyndon, Marysville, McPherson, Pratt and Wellington. According to a press release distributed by SRS, the considerations for selecting offices for closure were caseload size, proximity to other SRS offices, and the ongoing focus on providing services in the most cost efficient means possible. The state had 106 SRS offices, at least one in each county, before scaling back significantly between 2003 and 2007, when they closed 63 offices. Following the closure of the next 11 offices, there will be 33. Osage County alone has hundreds of cases, which will likely be serviced by remaining offices in Emporia, Ottawa and Topeka.